Our products are designed specifically for the digital artist. Our goal is to establish a reputation for high quality, comfort, and performance among artists worldwide. NEW to the SHOP!! The DokiMazo V2 Pro Glove for touch sensitive mobile devices!! PALM REJECTION! 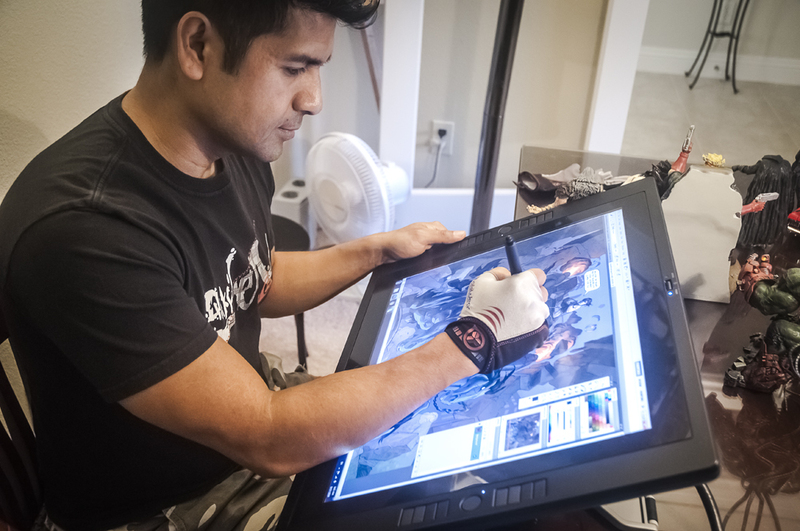 What Is The CG Art Glove All About? 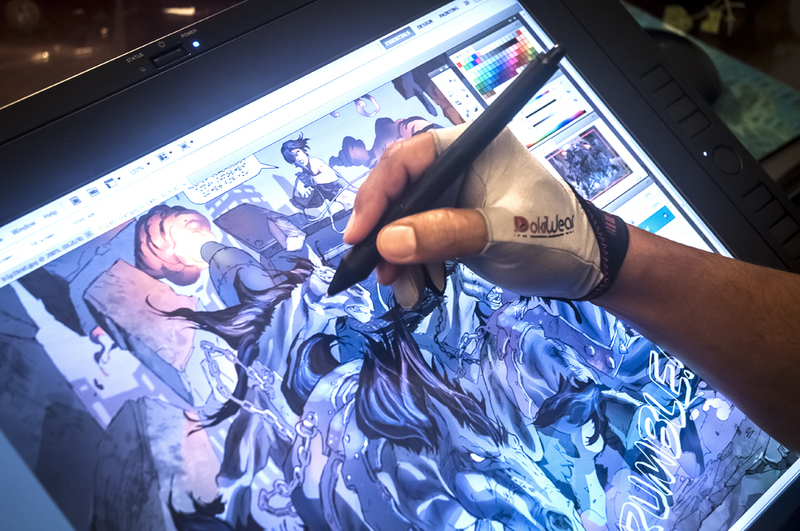 The DokiWear CG Art Glove (Patent Pending) is a high quality, sports compression glove with a microfiber cleaning palm ridge designed primarily for digital and cg artists, allowing them to work on drawing tablets and Wacom Cintiq™ surfaces smoothly, cleanly, and comfortably. It incorporates several specially designed features (below) to alleviate common problems a digital artist deals with daily, such as needed support for a tired drawing hand and cleaning for a dirty drawing surface. As simple as this concept may be, it has been vigorously designed and tested for over 24 months in studio and home environments by professional artists. 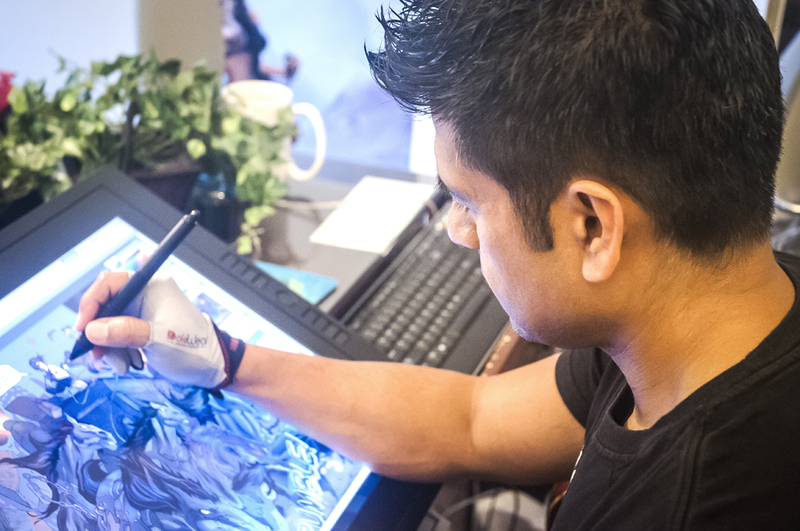 moisture transferred from the hands onto the glass to dirty up, scratch, and cloud the drawing surface of tablets, Wacom Cintiqs™, and mobile touchscreen devices. Second, we wanted to incorporate hand and wrist support while creating artwork throughout the day. Third, we wanted high quality, durable materials that not only function like a second skin, but are aesthetically good looking as well - after all, we are professional artists. The quick and dirty solution was to purchase cheap & simple cotton gloves and cut off 3 of the 5 fingers. The makeshift gloves disintegrated quickly and scratched the prized drawing devices. Our search for such a product gave minimal results, aside from the obvious home made remedies, and ones on the market that fell short of our expectations. We quickly realized that we would never find the quality and standard, so we decided to make our own. Designed features of the CG Art Glove include microfiber cleaning of drawing surface and sports compression material tech. Note: Images show sample prototype only. How Does It Help You, The Artist? Give your hand the support it needs for long term performance. The CG Art Glove is made of high-quality sports compression material. 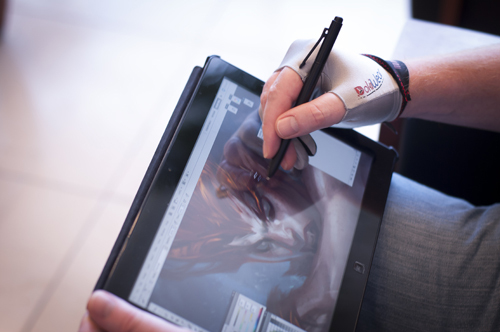 It is a blend of fabrics that will allow for four-way stretching to enable compressive support on the artist’s hand. 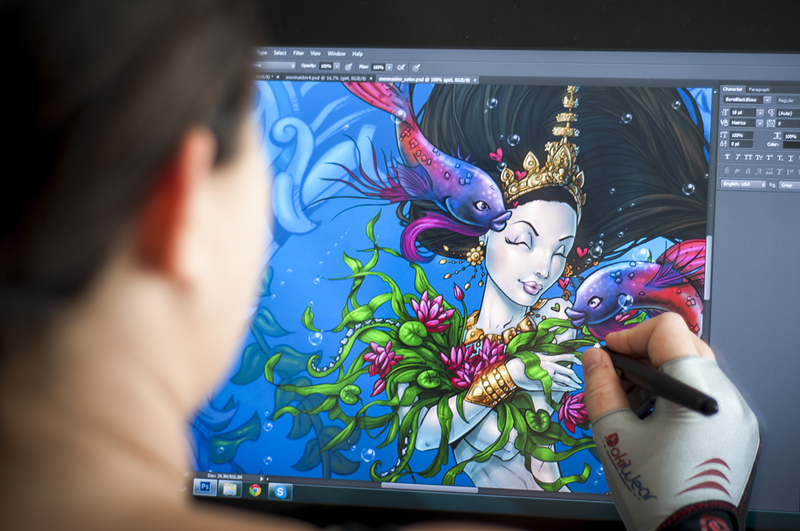 You've spent a small fortune on a Wacom Cintiq™ or a drawing tablet, now you want to take good care of your investment. The CG Art Glove is designed with high-quality glass lens cleaning microfiber fabric. The fabric is stitched along the palm ridge of the hand to clean the digital drawing glass surface without creating scratches. 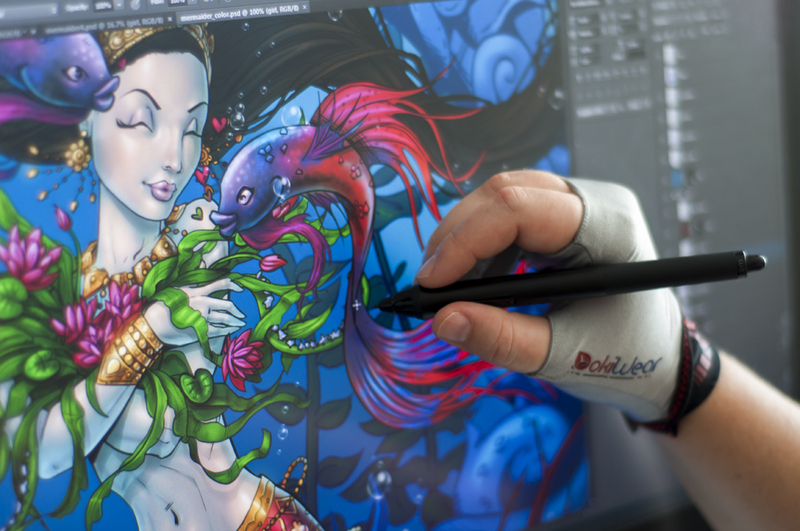 The artist can rest her/his hand naturally on the drawing surface to work. 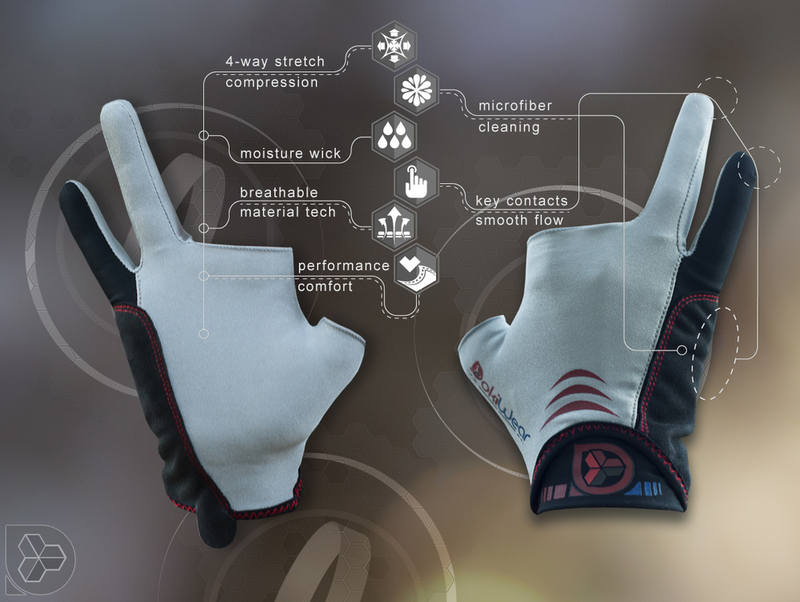 The glove is designed to promote smooth movement along the surface while simultaneously cleaning it. Your Wacom Cintiq™ is your baby, so take good care of it! As professional artists, we not only have an eye for aesthetics of design and style, but on performance, utility, and functionality as well. For example, the fabric grain is strategically aligned in specific directions for optimal fit, flex, and comfort. 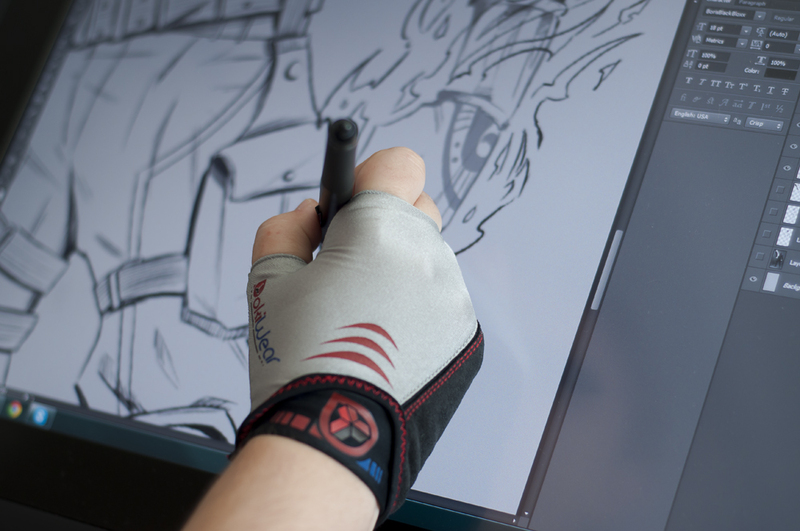 The functionality and comfort we’ve been looking for is now wrapped in a good looking digital art glove design we are proud to wear and share with fellow artists. The 4th finger, 5th finger, and the palm ulnar ridge provide key contact points for resting on the drawing device. Supporting those points is key to reducing moisture and oil contacts to the glass surface, and allowing smooth movement and hand bracing when working.